Your holiday day trip includes a visit to Kohl's Stony Hill Tree Farm and Christmas Shoppe for a behind-the-scenes tour at a Christmas Tree Farm in operation during the "off season", a visit to the Rolling Hills Red Deer Farm to see over 400 red deer raised on this farm, a delicious lunch and plenty of shopping. Your holiday day trip to Milton, Pennsylvania, located in South-Central Pennsylvania, begins with a visit to Kohls Stony Hill Tree Farm and Christmas Shoppe for a behind-the-scenes tour at a Christmas Tree Farm in operation during the off season. You will learn how Christmas trees are raised from planting to harvesting; about the different varieties of trees the farm owners have chosen to raise and why; and about some of the equipment used on the farm for planting, trimming, spraying and harvesting. You will also see how live wreaths are made at the farm, enjoy viewing the owners tree stand collection featuring over 1,000 items, and have time to browse and shop, in one of Pennsylvanias largest Christmas shops, for holiday gift items for sale, including a large selection of ornaments, lights, tree toppers, skirts, tree bags, nutcrackers and much, much more! A holiday ornament is included as a special treat for you as part of our visit. Next, we are treated to a delicious lunch at the Front Street Station in Northumberland, Pennsylvania. Relax and enjoy a unique dining experience in an authentic 1910 train station transformed into an eatery. After lunch, we depart for Catawissa, Pennsylvania to visit the Rolling Hills Red Deer Farm. Be sure to have your camera ready as you climb aboard a wagon for a guided hayride through more than two hundred acres of rolling pasture and woods to see over 400 red deer raised on this farm near Bloomsburg, Pennsylvania. You will even have a chance to hand-feed the deer and snap pictures throughout the wagon ride. A couple of the big male deer know how to climb up the back steps of the wagon and stick their head in to receive treats. Can you say photo-op! Before departing for home, you will have time to visit the gift shop for souvenirs such as t-shirts, sweat shirts, hats, antler key chains and more! Your holiday day trip to Milton, Pennsylvania, located in South-Central Pennsylvania, begins with a visit to Kohl's Stony Hill Tree Farm and Christmas Shoppe for a behind-the-scenes tour at a Christmas Tree Farm in operation during the "off season". You will learn how Christmas trees are raised from planting to harvesting; about the different varieties of trees the farm owners have chosen to raise and why; and about some of the equipment used on the farm for planting, trimming, spraying and harvesting. You will also see how live wreaths are made at the farm, enjoy viewing the owner's tree stand collection featuring over 1,000 items, and have time to browse and shop, in one of Pennsylvania's largest Christmas shops, for holiday gift items for sale, including a large selection of ornaments, lights, tree toppers, skirts, tree bags, nutcrackers and much, much more! A holiday ornament is included as a special treat for you as part of our visit. 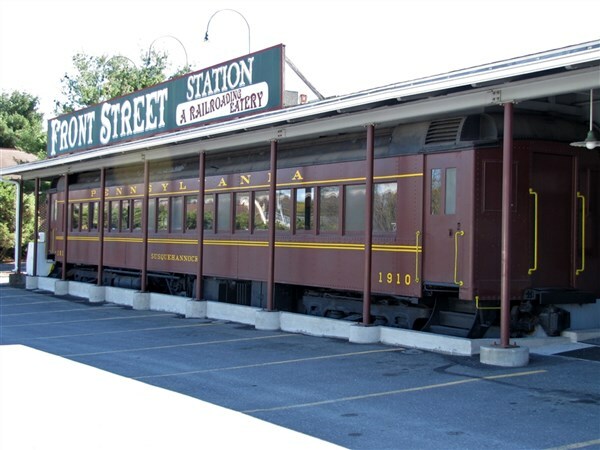 Next, we are treated to a delicious lunch at the Front Street Station in Northumberland, Pennsylvania. Relax and enjoy a unique dining experience in an authentic 1910 train station transformed into an eatery. After lunch, we depart for Catawissa, Pennsylvania to visit the Rolling Hills Red Deer Farm. Be sure to have your camera ready as you climb aboard a wagon for a guided hayride through more than two hundred acres of rolling pasture and woods to see over 400 red deer raised on this farm near Bloomsburg, Pennsylvania. You will even have a chance to hand-feed the deer and snap pictures throughout the wagon ride. A couple of the big male deer know how to climb up the back steps of the wagon and stick their head in to receive treats. Can you say photo-op! Before departing for home, you will have time to visit the gift shop for souvenirs such as t-shirts, sweat shirts, hats, antler key chains and more!